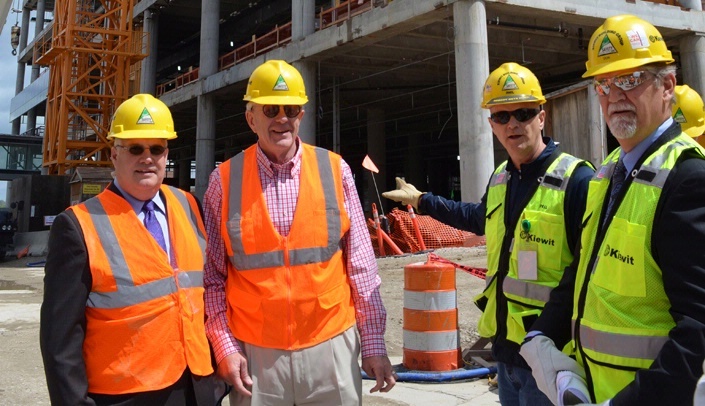 From left, Bruce Carpenter, Senior Vice President, HDR, Inc.; U.S. Rep. Brad Ashford; Phil Spencer, Project Manager, Kiewit Building Group, Inc.; and Don Mohlman, Senior Project Manager, Tetrad Property Group. Rep. Brad Ashford heard about how cancer research and treatment will be integrated into the Fred & Pamela Buffett Cancer Center on Thursday when he met with architects and UNMC campus leaders to review construction progress and go on his first tour of the building. While still in the state legislature, Rep. Ashford worked to secure state funding for the cancer center, which is slated to open in the spring of 2017. "I'm very familiar with UNMC. This cancer center is the culmination of a tremendous amount of work by a lot of people." Ken Cowan, M.D., Ph.D., director of the Fred & Pamela Buffett Cancer Center, presented an overview of UNMC's cancer research and care and emphasized how the building will foster additional bench to bedside collaboration. Dr. Cowan also outlined how recruitment efforts have brought more than 23 new outstanding research faculty and seven excellent clinicians to campus. Rep. Ashford then met with UNMC Chancellor Jeffrey P. Gold, M.D., to discuss the medical center's mission. He said he was impressed with UNMC's unique collaborative environment and its global presence that brings in patients from all 50 U.S. states and 73 countries. "UNMC has global reach -- it can export new drugs and devices and provides cancer and transplant health care around the world," he said. "Today, I learned about how clinicians and researchers collaborate to improve health care and how the HDR design of this new building meets that vision. Truly exceptional work is being done on the UNMC campus. It's another great Nebraska story."